Protect your Masterbuilt Digital Electric Smoker with this cover. The durable, polyurethane-coated cover protects your smoker from the elements year-round. It's weather-resistant and resists fading. 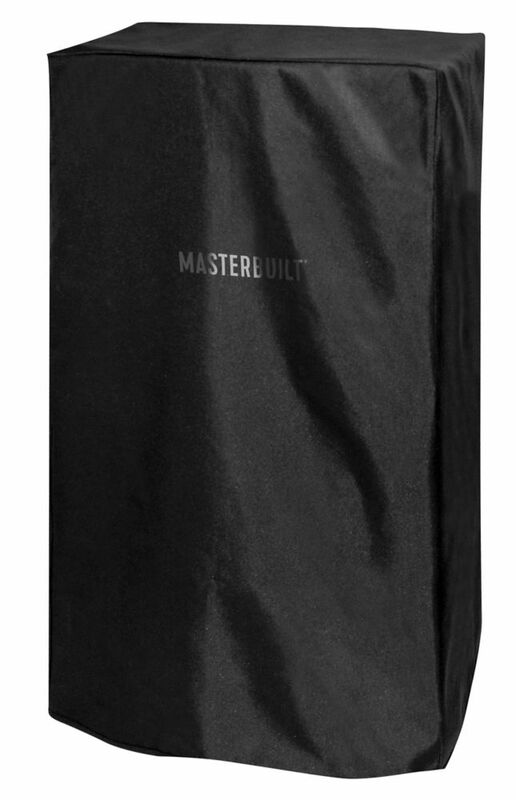 Master the art of smoking with Masterbuilt. 38-inch Electric Smoker Cover Protect your Masterbuilt Digital Electric Smoker with this cover. The durable, polyurethane-coated cover protects your smoker from the elements year-round. It's weather-resistant and resists fading. Master the art of smoking with Masterbuilt. 38-inch Electric Smoker Cover is rated 4.5 out of 5 by 23. Rated 5 out of 5 by Chefbowpro from Smoker was super simple.to finish assembling. Only a few small parts needed to be attached. The r... Smoker was super simple.to finish assembling. Only a few small parts needed to be attached. The remote control that reads the meat probe and can adjust time and temp is a great addition to the already great product. I purchased a cover, additional racks for jerky, the sausage hanger hooks, the racks for ribs and a chicken a few whole chicken stands. I probably smoke over 2k pounds of meat a year out of these smokers! 8 kids and a food truck, these smokers last for years and years! If you want a smoker, then there is No need to spend a nickel more than what this smoker costs to achieve just that. Simple, easy to use, easy to clean and works flawlessly. Rated 5 out of 5 by Queen from Love it , love it! Smokes food awesomely. Only learning curve is to trust the process, trust t... Love it , love it! Smokes food awesomely. Only learning curve is to trust the process, trust the smoker...because everytime you open the door you loose your temp drastically. Would definitely buy again. Rated 5 out of 5 by Jim from We could not be happier! Excellent!... We could not be happier! Excellent! Rated 5 out of 5 by Opcon from This cover fit perfectly. It fit my 40inch. Signature grill with no problem(Masterbilt). This cover fit perfectly. It fit my 40inch. Signature grill with no problem(Masterbilt). Rated 5 out of 5 by Piloto from Great first time smoker for the money. ... Great first time smoker for the money.